Kaohsiung (高雄; Gāoxióng) ) is, with over 2.7 million inhabitants, the third most populated city in Taiwan after New Taipei and Taichung and is located in the south of the island. Kaohsiung is known for its harbor, although more for commercial than tourism reasons. Hence it is also known as the Harbor Capital (港都) of Taiwan. 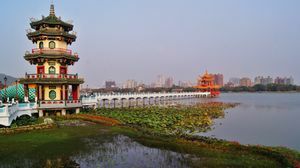 Its year-round fine weather and the low cost of living make Kaohsiung the place to visit. Kaohsiung is Taiwan's third largest city and its largest port. Although its volume of shipping has declined steadily over the last few years, Kaohsiung is still the world's sixth largest cargo-container seaport, and with a state of the art cruise terminal scheduled to open in 2018, its harbor may be much busier soon. The city has high concentrations of heavy industry, including steel production, shipbuilding, and other exports that have led to Kaohsiung's relatively high levels of air pollution (though the situation has improved substantially in recent years). Unlike Taipei, Kaohsiung is a planned city with wide streets and less traffic congestion than the capital. In recent years the city has made great strides in transforming itself from a primarily industrial city into a modern Asian metropolis, and several areas of the city, such as along the banks of the Love River (Ai He, 愛河), have benefited from major beautification projects under the tenure of former mayor Frank Hsieh. The city is often known as Taiwan's "Harbor Capital" (港都) because of its close connection and heavy reliance on the ocean and maritime transportation. It is also one of the most bicycle-friendly cities in Taiwan, with numerous designated bike paths running through the city's many parks. 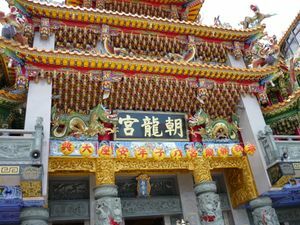 Kaohsiung began in the 17th century as a small fishing village named "Takao" (打狗), derived from the local aboriginal name meaning "bamboo forest". The name was changed to "高雄" (meaning: "high hero") by the Japanese in 1921, also pronounced "Takao" in Japanese, as they found the original name of 打狗 ("beating the dog") to be vulgar. The modern name of "Kaohsiung" is the pronunciation of "高雄" in Mandarin. Kaohsiung International Airport (IATA: KHH)  is about twenty minutes to the south of the city center. 1997 a new terminal was added dedicated to international connections and transfers to Taipei international airport . International flights from Asia arrive daily, but unfortunately, there are no direct flight connections between Taipei and Kaohsiung. However, the high speed rail is a hassle-free alternative. The airport is on the MRT Red Line and is also easily accessible by scooter, car or taxi (around 300NTD from central areas). Taiwan High Speed Rail line (HSR). Traveling by train is a viable option for getting to Kaohsiung, as the fastest trains from Taipei cover the distance in just 90 minutes. There are 3 types of tickets: Business Reserved, General Reserved, and Non-Reserved. Reserved are approx. NT$1500 ($50 USD) and non-reserved slightly cheaper at NT$1400. Remember to get Designated Seats if you are traveling with luggages, it's <NT$100 more expensive. Please note The HSR terminal is in Zuoying (左營, also Tsoying) on the northern outskirts of town, and you'll need to connect to the city center via the MRT Red Line (approximately NT$20-25), bus, ordinary train, or taxi (approximately NT$250-350). The MRT Red Line now extends to Kaohsiung Main Station (#R11) and the HSR Station (#R16) and beyond (see system map here: http://www.krtco.com.tw/en/service/service-1.aspx). 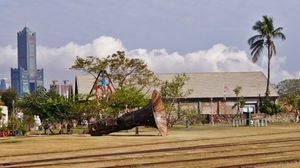 Kaohsiung is also served by the Taiwan Railway Administration's Western Line and Pingtung Line. The city is roughly 4 to 5 hours away from Taipei by normal express train. Buses run the length of the island, with stops in major towns. They feature fully reclining seats, baggage transportation and, on some, video game consoles or televisions for each seat. Prices run around NT$1000 per trip, give or take, depending on the initial and final destination. Tickets to Kaohsiung from Taipei cost around NT$ 600 with Ubus (as of July 2017). Can be purchased at convenience stores like 7-eleven for a NT$ 10 fee. You can take a bus from the airport in Taipei, even during the night. The first bus will drop you in front of a small building with benches outside. Wait there for 30 minutes and then the main bus will arrive. The ride to Kaohsiung takes around 4 to 5 hours. Kaohsiung is the last stop so you cannot miss it. Every stop is clearly pronounced so that even foreigners who don't speak Chinese can understand. Most major bus companies have their office and stops close to the train station. They are located on the same road as the train station, about half a block down the street. There are year-round ferries connecting Kaohsiung with Magong and Qimei in Penghu Country. Furthermore there is an international cargo vessel connecting with Okinawa, Japan. This ship run by RKK line, Ryukyu Kaiun Kaisha, that has a weekly schedule connecting Okinawa, Japan and Kaohsiung, Taiwan, departing from Ishigaki, Okinawa on Saturday and 3PM, arriving on Sunday, 7AM. Then departing on the same day from Kaohsiung at 12PM and arriving at Naha, Okinawa on Monday at 4PM. However, this schedule is only tentative as it is a cargo transport. To book a ticket you'll have to call the company at 098-868-8162. No emails provided. As the sidewalks double as scooter parking areas, caution and awareness are a must when walking through unfamiliar areas off of main streets. Generally, it is best to walk between the scooter parking row and store fronts, rather than between parked scooters and the road. Pedestrians should be especially aware when crossing a road as cars and motorbikes often run red lights. Exploring Kaohsiung on foot is highly recommended, as many of the distances between sites of interest are not far. Kaohsiung MRT  has two lines. The Red Line runs from north to south, offering a handy route from both the THSR Zuoying station and the airport into the downtown core, while Orange Line runs across the city from the Port of Kaohsiung in the west to eastern suburb of Daliao. The Metro Line is very clean and offers a convenient way to quickly move within the city. The MRT closes at about 23:30 for the orange line and as late as 00:30 for the red line. For exact first and last train times, look up the official website. Feeder buses are available to bridge network gaps and provide better access to the metro lines. The MRT stations are all well connected to the city bus lines for further transfers. Stations and trains are wheelchair-friendly, but note that when there are multiple exits from a single station, usually only one of these is equipped with a lift. One can purchase a single journey ticket or use a rechargeable IC card. Phase one of a new light rail (Circular Line) servicing areas around Pier 2 to south of Dream Mall is expected to open around January 2016. Scooters are the primary means of transportation within Kaohsiung. With a dedicated two-wheel vehicle lane on most major roads, and with frequent and varied scooter shops around town, renting or purchasing a scooter is very easy; however, see the Taiwan article for legal issues including licenses. Scooters come in several engine sizes from below 50cc to more than 250cc. Most common in recent years are the 4-stroke 100 and 125cc models, which are also suitable to explore the surroundings of the city. The larger scooters, 150cc and more, often include a greater subset of amenities for a second passenger, including a backrest, wider seat, full windshield and footholds and can rival a motorcycle overall size, weight and fuel consumption. Often, they come with larger wheels as well. All passengers on a scooter must wear helmets by law. Helmets are sold almost everywhere, and range in price from 100 NT$ to upwards of 2,000 NT$. A helmet with visor is strongly suggested. The city government has established Taxi English Service to allow travelers to search for English-speaking taxi drivers in chosen areas. Taxis can be an easy way to get to somewhere unfamiliar, and are fairly common in the city. If you have the business card of a location, or the Chinese characters written down, they can easily get you there far faster than most other means. You may ask for the price in advance but as with anywhere in Taiwan the meter is almost always used. Few taxi drivers speak English, and the majority ignore any and all rules of the road. Do not be surprised if they drive the wrong way, up a hill, through heavy traffic. Typically, going from one end of the city to the other should never be more than 400 NT$. This behavior of cab-drivers is rarely seen nowadays however may still happen more often on the country side. Do not be surprised if they open the door and spit what looks like blood. In actuality, the taxi driver is chewing betel nut (binlang) . This commercially available product is a mild stimulant and is used by many taxi drivers. Uber now also operates in the city although there is some controversy with the government and the ride-sharing company. Bikes are also common in Kaohsiung, and the large number of locally produced bikes (often rebranded and sold overseas) means purchasing a new bike will often be cheaper relative to its counterpart in other countries (primarily Europe and America). The city operates a great bicycle rental service around the city -- www.c-bike.com.tw provides you with a map of where all the stations are, and an up to date counter of how many bikes are in each location. Rental points are usually located at MRT stations, but there are also other locations. Bicycles can be dropped off at any station, not necessarily the one from which it was hired. If you want to use your iPASS card (一卡通), to rent the bike, the card must be registered at an MRT station with an ARC or Taiwanese proof of residence. For foreigners, using a credit card (usually Mastercard/Cirrus or Visa) is the best solution. Regardless of which method you use, the first 30 minutes of bike rental is free, with 20 NT per 30 minutes afterwards (30 NT per 30 minutes if you're using your credit card). The price may vary, the latest rate please check with each rental station. You must swipe the card after you return the bike to pay. Most of the bikes are in great condition, and the seat can be adjusted. They also have a flickering light on the front and a red light on the back at nighttime, and both lights are activated when you're pedaling. It's a good idea to check to make sure the bike's lights are working if you are cautious about nighttime biking. Giant, a well-built, recognized Taiwanese brand, has shops throughout the city, and some of the store managers speak English. Bikes are street legal, even without a helmet, but theft is common for any bike over 3,000 NT$. Until recently, even serious violations of the traffic rules by cyclists are were not fined, however, government authorities are planning to change this in the not too distant future. 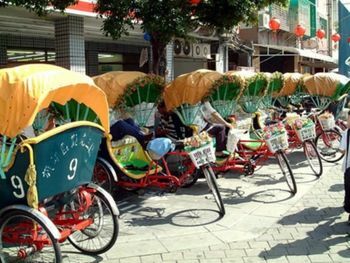 As Kaohsiung is predominantly flat, a great way to see the city is by bike. Riding along the Love River north towards the Art Museum area offers a pleasant ride and some scenery of the old Kaohsiung that is fast disappearing. Pleasant bike routes can also be found around Sun Yet-Sen university and on the coastal side of Shoushan mountain, but expect a few hills to climb. It is best to avoid this place on the weekends when hoardes of young Kaohsiung couples head to the mountain for some romantic sunset views of the city and ocean at one of the countless coffee shops. Cijin Island also offers some nice riding around the streets at the northern end of the island. It is not yet legally possible to bicycle to and from Cijin as the underwater Kaohsiung Harbor Tunnel to and from Cianjhen District is officially closed to bicycles around the clock, even during late nights when ferries stop running. However, you can bring your bike on the ferry from Sizihwan. The total fare for one person and a bicycle is NT$15 (which you can pay for with your K-MRT card). Some visitors may rent from shops which don't require the international or domestic driver license, by doing so may violate the Taiwanese law and face the fine up to NTD $12000. Visitors rent from those shops may not be insured or under insured. Do check if the scooter is properly registered, the scooter may not even being registered under the name of the business, if the scooter was stolen, the rider may face the criminal charge of possessing booty, possible to serve jail time. Scooters with an engine size of 50cc require a light motorcycle license to drive, and should be insured and registered in the owner's name. If you have a Taiwanese automobile driver's license or a valid International Driving Permit you do not need an additional license for these small scooters. Motorcycles with an engine displacement of 51 to 250cc require a heavy motorcycle driving license. However, foreigners often drive scooters up to 250cc with no license, insurance or registration. Due to a loophole in Taiwanese law, scooters registered to foreigners who have left the country cannot be bought by Taiwanese citizens because the registration cannot change hands, legally. An underground market in "foreigner scooters" allows visitors to purchase scooters without insurance or registration. City police are often more lenient on foreigners. Short of being towed for parking in a red zone (a stripe of red paint on the edge of a sidewalk or road), foreigners are usually waved through stops, or, at best, ticketed. If the scooter is not registered to you however, its hard to say what exactly happens when the ticket is sent out. Often the best idea is to speak a language other than English or Chinese, play dumb and hope the officer will get flustered and let you go - that is, if you're the type who likes to break laws in foreign countries. Rentals are available in various locations across town, but obtaining a license within the city can be a problem. It is recommended you call ahead if you have an international drivers license to insure it will allow you to drive. In addition, license laws in Taiwan fluctuate from year to year for foreigners. Currently, as of 2006, you must have an Alien Residence Card for more than a year to take the license examination. Parking is scarce, but available. The city recognizes this problem, and attempts to make the city more car-friendly by building parking garages and painting designated parking spaces alongside streets. However, for travel within the city itself, or only locally, it is recommended you get a scooter. An inexpensive ferry service connects various areas of Kaohsiung City, including Taiwan's nearest island, Xiao Liuqiu (小琉球) - Little Ryukyu - which is a coral island located just south of Kaohsiung and is reachable by ferry from Dong Gang (東港), which is itself only a 15-minute taxi ride or 30-minute scooter ride from Kaohsiung International Airport. Take bus No.1 at the Kaohsiung Train Station OR take bus NO.31 at the Zhuo Iing Bus Station to the Ferry Pier. Take bus No. 35 at the Ciang Zhen Bus Station to Cijin Peninsula. Take Bus No.12 at the Kaohsiung International Airport to Shiaugang and take Bus No.14 to ChiangZhen Ferry Station. The Cijin District (旗津, Qijin)] is a slender island in Kaohsiung harbor which serves as a natural breakwater for the harbor. The district is filled with seafood restaurants selling freshly caught seafood which can be prepared right after you pick it out. Cijin is connected to the rest of Kaohsiung City by underwater tunnels, but the transporation of choice is one of the many ferries that traverse the harbor. Fare for the ferry ride is NT$25 (Oct 2015) per person. Bikes and scooters can be brought aboard, but the fee is NT$35 with a bicycle (Oct 2015), slightly more for scooter. The ferry is easily accessible for wheelchairs, which can share the space with scooters and bikes. The street that goes straight from the ferry has about two blocks of snack stands, as well as seafood restaurants near the end. There is also a plaza with a fountain and a beach at the end of the street. If you rent a bike (either before or after the ferry ride), there is a nice coastal path (11km) that goes south along the beach. Bike rental for a day is typically NT$100, but can be as low as NT$30 for a fixed-gear bike rented just outside Sizihwan KMRT station. Going a short ways north will lead you to the lighthouse and the fort, which are located on a hill with great views of the city, the harbor, and the ocean. The area is especially crowded on weekends with many visitors bringing their entire family along. The island is also projected to be an international tourism spot in southern Taiwan by the city government. This effort can be seen through series of campaigns made by the government to introduce Chijin to the international level. Enjoy a coffee in one of the waterfront cafes along the Love River. Go to the top of The 85 Tower, the second tallest building in Taiwan. Hike Monkey Mountain (壽山; Shòu shān) and enjoy the view of the city and the ocean. Beware of the namesake monkeys, who have been known to steal hikers' food, drinks, and even cameras. For foreigners, work in Kaohsiung usually falls into two branches. The majority of employment involves English as a Second Language (ESL) work in buxibans (cram schools), kindergartens and schools (public, private or university). Most of the others are businessmen and women in the employ of multinational corporations here to manage, oversee or deploy production in Taiwan for their home company abroad. 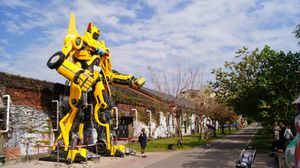 Substitute work is easily available for native English speakers and can be obtained through internet groups such as Taiwan Teaching Jobs .... or Connect Kaohsiung or through local postings in expatriate hangouts. More permanent teaching work is also available, especially in the summer and around Chinese New Year. Most buxibans require teachers to sign a 1-year contract and provide a work permit and ARC (Alien Residence Card). ARC holders are also covered under national health insurance. Without the proper paperwork - including a 4-year university degree - you cannot get an ARC and will need to leave the country every 2-4 months to renew your visa. You will also be working illegally, which involves a number of other inconveniences (including lack of phone and Internet access). It is also highly illegal for foreigner to work as teachers in kindergartens few provide work permits. There are numerous seafood restaurants dotting the main street in Cijin Island, all offering the same fresh seafood for about NT100-200 per dish. It is a great idea to go in a small group and order a few dishes to try, probably one more dish than the number of people in your group. In the evening, a night bazaar goes into full swing. There are lots of little eats to eat as per Taiwan's night markets, BBQ squid, mochi to name a few are particularly good. Night markets are a great place to pick up cheap local foods, including stinky tofu, barbecued squid, red bean pancakes and the like. The Liouho Night Market (六合夜市) is the most typical tourist night market and offers local dishes such as salty glutinous rice balls (咸湯圓) stuffed with pork, oyster omelette (蚵仔煎) and tofu pudding (豆花). This market is very popular with Mainland Chinese tourist groups, open pretty much every day after 5/6 PM and convienently located at MRT Formosa Boulevard. A more local, food-oriented night market is Rueifong Night Market (瑞豐夜市), straight outside exit 1 of MRT Kaohsiung Arena. It is open Tue, Thu, Fri, Sat, Sun, but if you are afraid of crowds you should avoid the weekends. A similar night market is 青年夜市 near MRT Da-Dong. Lunchboxes are common throughout the city, and a choose-your-order buffet take-out typically ranges from 50 to 100 NT$. The food is typically fried, with a mix of vegetables and meats. The ubiquitous 7-Eleven stores have tea eggs, hot dogs, packaged beverages and junk food. Lunchbox style microwavables are also available, including dumplings, spaghetti and curry rice. Bull Fighter Restaurant is located in downtown near Love River (5 minutes by foot) and the Central Park (10 minutes). 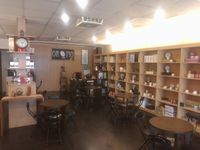 Address: 79, Wu Fu 3rd Road, Cianjin District. TEL: (07)241-5530. It mainly serves steaks and grilled seafoods and is suitable for most Western visitors at fair costs (around 4 or 5 hundred NTD each, free salad bar included). Or, if you do not like to eat too much meats, you can choose pastas (only 200 NTD, free salad bar included). Smokey Joes offers Tex-Mex, including fajitas, tortillas and other Western staples at affordable prices (170 NT$ and up). The menu is in English and the staff usually understands some English as well. They offer a 'VIP' card for people who spend over 1,000 NT$ on 20 separate meals which gives the holder at 10% discount at any store operated by Amy (the owner of Smokey Joes). This includes Mama Mia's, an Italian restaurant located downtown. The Spice Shop, 508 Mingcheng 2nd Road. Tel:+886 7 558-5709. An Indian restaurant serving a-la-carte style meals, with each dish ranging from 120 NT$ to 270 NT$. There is also a Ruth Chris in town. Taiwan Beer is ubiquitous throughout the island and can be purchased by visitors cheaply with little hassle about age restrictions. Most major soft drinks are available, and tea stands on almost every corner offer concoctions of fruit, yogurt, green tea, the Taiwanese specialty "bubble tea," and a variety of other flavors. Locals consider the tap water NOT to be potable, though as in most of Taiwan, the government claims water quality is now up to international standards. Filtered water dispensing stations are present throughout the city, though some have been accused of simply distributing tap water. Restaurant water is safe, with the possible exception of some lunchbox eateries and stands on the street. Lukot INN Traditional Taiwanese style guesthouse, 5 min walk from Sizihwan Stn., near NSYSU and Gushan ferry pier (to Cijin), single NT$600, twin NT$900, triple NT$1350, dorm NT$450, [email protected], 0930323933. Huahou Hotel, (華后大飯店) 219, Gong Yuan 2nd Road. Tel:+886 7 551-8251. . Clean hotel near the river. From US$30, including brunch. Venus Hotel, (高雄昭来大饭店) 311, Cing Nian 1st Road. (青年一路311號). (SE Corner of Jhongshan 2nd Road/Cian Nian 1st Road). Tel: +886 7 333-5111. (note: website is in Traditional Chinese). Clean and affordable hotel near the city center and shopping centers (Far Eastern 21 shopping mall, night markets) and minutes from KMRT stations (between R8 and R9 stations)right across the street from Brickyard. Free breakfast is included in room rate with choice of traditional Eastern or Western style faire. The hotel offers free internet and the front staff speaks enough English to get you what you need or to get you where you need to go. Rooms from US$27 (NT$880) for students; US$33 (NT$1099) for everyone else. Howard Plaza Hotel Kaohsiung, (福華大飯店) 311 Chihsien 1 Road. Tel:886 7 236-2323, . The Splendor Kaohsiung, (金典酒店) 7-85F, No. 1 Tzu-Chiang 3rd Road. Tel:886 7 566-8000, . The Royal Lees Hotel Kaohsiung, (高雄‧麗尊大酒店) No.105, Wufu 1st Road. (高雄市苓雅區五福一路105號) . The Royal Lees runs about $3000-4500 NT$ (about $100-150 USD) per night. The staff all speak English and they are extremely helpful in every way. The hotel is well maintained and in a nice district. Kaohsiung Living, (高雄生活外籍論壇) 25 Boai Road, Zuoying District, Kaohsiung City . Kaohsiung's crime rate is much lower than probably any city of comparable size in the West, so tourists need not be too worried. Theft tends to be the most common form of criminal activity encountered by foreigners, and expensive bikes and scooters are frequent targets. As a major seaport, organized crime has also become an increasing problem in the city, and a fair number of businesses are nothing more than a front for local gangs. That said, the gangs do not resort to random violence or theft. In general, Kaohsiung offers a very safe environment as long as you mind your own business and don't get involved with local rivalries. Violent crime is very rare, and visitors should not encounter any problems - though, like any major city, it is always wise to err on the side of caution. There have been cases of Dengue fever reported in the Kaohsiung area (around a hundred locally contracted cases in the first half of 2015). Take precautions against mosquitos. Tainan is to the north. Pingtung County is to the immediate east and south. All the way to its southern end is Kenting. Taitung County is to the east. However, the Southern Cross-Island Highway (Provincial Highway Number 20) is closed mid-way since 2009-08-08 due to the Typhoon Morakot , so you have to take a very long detour via the South-Link Highway (Provincial Highway Number 9). This page was last edited on 6 December 2018, at 10:17.